I will tell you how to successfully hold a business event in Japan. How would you like to finally start something new this spring? How would you like to bring a special someone with you? amazing cuisine, and amazing experiences of wearing a Kimono, Japanese tea, Incense, Traditional Japanese Music and Dance, the elegant culture of loving cherry blossoms, and so on. Happo-en is a very special location. It features a garden with our 300 years of history, and has easy access from both inside and outside Japan. Access sill soon be even easier with the opening of a new train station near us. Guests can feel traditional culture and history even in the center of Tokyo at one of the best most unique venues in the city. We listen closely to our customer’s needs and requests, and communicate closely to find the best solutions. Careful planning leads to successful business events and improve business chances. Planning and production are our strengths. We select our best team members for your event who woll turn your needs and wishes into a reality. Your requests will bee reflected in a planning document including event timetable, the decoration of the banquet room, invitation design, the making of original goods, music, entertainment, an original movie, and operations. Happo-en has strong confidence in serving the best food for your event. We will provode cuisine that meets your needs, including allergen-free, gluten-free, organic, and vegetarian- or vegan-friendly foods. Our original cuisine will perfectly suit you and your guests. 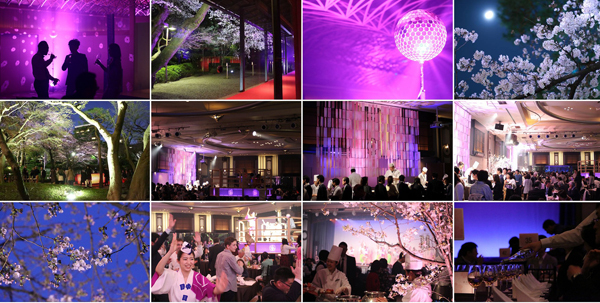 Our total production solutions will lead to your successful events in Japan. Our team members will truly help you to have an Amazing Experience and make all of your wishes come true.